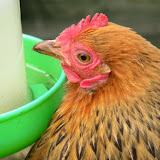 Our original hen keeping adventure came to an end in January 2013, when a fox took our entire brood of hens. 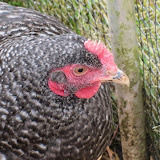 But don’t let that put you off … you can find the story at The Hen House Archive where there are still lots of stories, photos, and information about keeping hens I hope you'll find useful. July 2018 … Four new girls arrive, two LS bantams and two Mille Fleur Pekins. June 2018 … We had an extended heatwave, with daily temperatures in the 30s.